A most deceiving three bedroomed detached family home enjoying a cul-de-sac location situated on the South Western side of the City. Further advantages include a gas central heating system, uPVC double glazing, a modern range of kitchen units with integrated dishwasher and washing machine, built-in wardrobes to all Bedrooms, En-Suite Shower Room to the Master Bedroom, Ground Floor WC, an impressive Conservatory extension to the rear, driveway and Integral Single Garage. There is also a good sized and well established rear garden. LOCATION The property is well located within this popular residential area and within close proximity to a wide range of local amenities including schooling, doctors’ surgery and the Birchwood Shopping Centre. ENTRANCE HALLWAY With uPVC door to the front aspect, laminate flooring and door to the Lounge. LOUNGE 14′ 5" x 11′ 6" (4.39m x 3.51m) (measurements exclude depth of bay window and under stairs recess). With marbled fireplace surround incorporating a centrally recessed gas fire, laminate flooring, radiator, coving to ceiling, bay window to the front aspect and archway leading to the Dining Room. DINING ROOM 10′ 8" x 8′ 8" (3.25m x 2.64m) With radiator, window to the side aspect, laminate flooring and doors to the Cloakroom and Kitchen. CLOAKROOM With low flush WC, pedestal wash hand basin, tiling to full height on all visible wall surfaces, coving to ceiling, wall mounted gas fired central heating boiler and window to the side elevation. KITCHEN 14′ 6" x 9′ 8" (4.42m x 2.95m) Fitted with a range of wall, base units and drawers with roll edge work surfaces over and deep ceramic tiled splash-backs, Belling Range Cooker with extractor fan over, integral dishwasher and washing machine, radiator, window to the rear aspect, door to the side aspect and French doors leading to the Conservatory. CONSERVATORY 22′ 4" x 12′ 5" (6.81m x 3.78m) With a brick base and uPVC doors and windows to the rear garden, radiator, ceiling fan and wall light point. 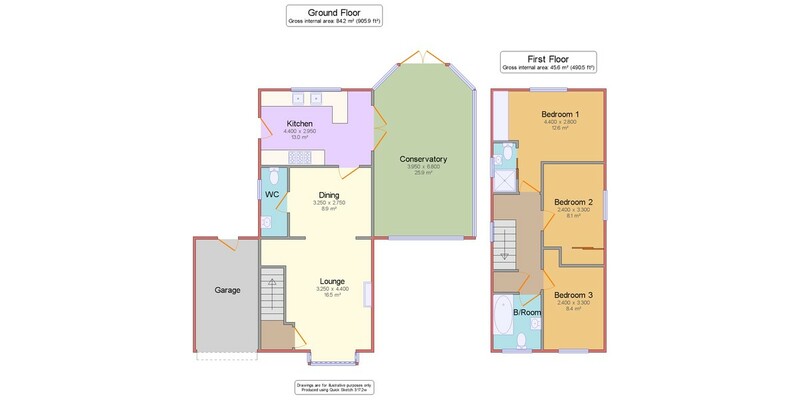 FIRST FLOOR LANDING With window to the side aspect, coving to aspect, access to roof void and doors to three Bedrooms and airing cupboard housing a lagged hot water cylinder. MASTER BEDROOM 14′ 3" x 9′ 6" (4.34m x 2.9m) (measurements include the depth of built-in wardrobes to one wall, but exclude door recess). With radiator, coving to ceiling access to roof void, window to rear elevation and sliding door to the En-Suite Shower Room. EN-SUITE SHOWER ROOM With fully tiled shower cubicle, pedestal wash hand basin and low flush WC, tiling to full height on remainder of walls, ceiling extractor fan and window to side elevation. BEDROOM 2 10′ 10" x 8′ 5" (3.3m x 2.57m) (Measurements exclude the depth of built-in wardrobes to part of one wall). With radiator, laminate flooring, coving to ceiling and window to the side elevation. BEDROOM THREE 10′ 10" x 7′ 9" (3.3m x 2.36m) With built-in wardrobe to part of one wall, radiator, coving to ceiling, laminate flooring and window to front aspect. FAMILY BATHROOM 7′ 3" x 6′ 6" (2.21m x 1.98m) With white suite to comprise of panelled bath with shower over, pedestal wash hand basin and low flush WC, coving to ceiling with extractor fan, towel radiator and window to the front aspect. OUTSIDE To the front there is a small raised rockery area and paved driveway providing off road parking and giving access to the Integral Single Garage. There is a most delightful and good sized enclosed rear garden with two timber decked areas, summer house, lawned area with paved pathways, slated borders, plants, flowers, mature trees timber pergola, ornamental pond and small paved seating area to the side. INTEGRAL SINGLE GARAGE With power, light and pedestrian access door to the rear.